It is speculated that Rindskopf was the maker. Only seen in marigold. 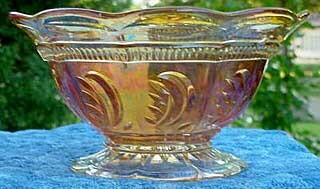 There are auction records of just four bowls having sold at live auction: one in 1996 for $85; one in 1999 for $50; another in 2004 for $30; and the fourth in 2006 for $10. The 7 3/4-inch example shown here sold on ebay in 2004 for $50. In 2005, two on eBay brought $57 and $77. At live auction in 2006 an example brought $10. Very few single Martha bowls sell at auction and this could be because they are put at the end of an auction in box lots. Photo courtesy of Fred Campbell.